Welcome to Snow Owl! If you're looking at this documentation for the first time, we recommend first reading through the Getting Started with Snow Owl guide to help orient you to the basic features. Once you're familiar with the lay of the land, this User Guide can help answer more detailed or advanced questions that you have. It's worth "liking" our Facebook page to keep up to date with new video tutorials, features and releases. It's also a good place to ask a question on an item that's not in our user guide. 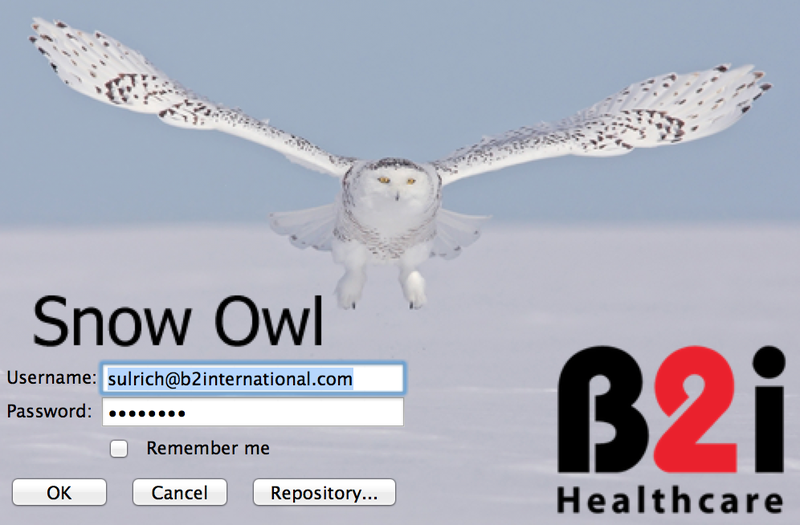 Snow Owl is an authoring platform for clinical terminologies. It supports the extended SNOMED CT compositional grammar (ESCG) for semantic querying, and allows the creation of intensional and extensional subsets among other reference set types that follow the IHTSDO SNOMED CT RF2 specifications. 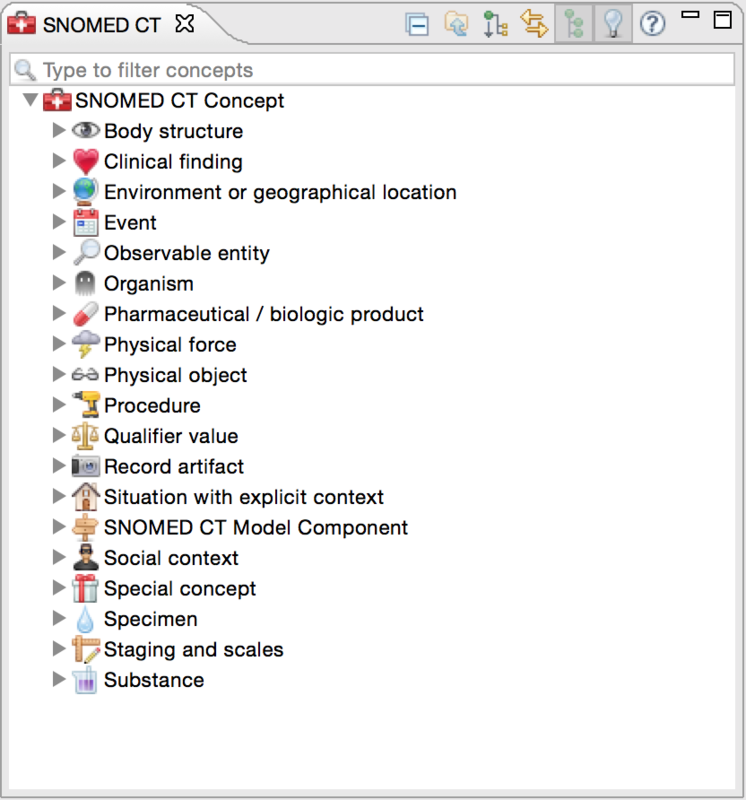 In addition to authoring SNOMED CT or a national extension, Snow Owl is designed to support a variety of ontologies and classifications. Snow Owl is designed to be a framework to support higher-level terminology authoring tools, such as drug and device dictionaries. Snow Owl is built upon the Eclipse platform, which allows us to easily integrate Eclipse-based application architectures within a single tool. An example of this integration is Stanford's Protégé Ontology Editor, which allows us to use any Protégé-compatible description logic classifier. Snow Owl also seamlessly integrates with information model tooling, such as the HL7 Static Model Designer and our Logical Information Model tooling to support domain model design, ontology authoring, and the binding between the two. Snow Owl can operate in two modes; in stand-alone mode supporting a single user or in collaborative mode with multiple users connected to a single server authoring the same terminology simultaneously in a distributed fashion. Browsing: Snow Owl supports browsing installed terminologies by browsing and filtering the concept hierarchy. The following terminologies are supported: SNOMED CT, ATC, ICD-10, ICD-10-AM, LOINC. Searching: Quick Search allows to perform searches across all terminologies from a single location. The Advanced search dialog can be used for searches on various kinds of resources (e.g. concept status, descriptions, references sets, tasks, files). Query authoring: Snow Owl includes an advanced editor for Extended SNOMED CT Compositional Grammar (ESCG) language expressions. The editor provides contextual support for query authoring by prompting you based on the ESCG language specification. Other features include: color highlighting, as-you-type validation; quick-fix suggestions for common errors, user-definable templates for common expression patterns, version control system integration, and more. Query evaluation: Snow Owl's query evaluation engine uses information from the semantic cache, the classifier, and indexes to improve performance. Reference sets: Reference sets can be created either manually ("extensionally") or automatically ("intensionally") with the use of an ESCG query. Extensional queries can be imported using the SNOMED CT Simple Type Reference Set. Intensional queries are compatible with the SNOMED CT Query Specification Type Reference Set and can be optionally converted to manual reference sets if desired. Mapping: Mapping between two terminologies is possible using Snow Owl's mapping feature, which is compatible with the SNOMED CT Simple Map Type Reference Set format, Complex Map Type Reference Set format, and uses automapping. Reporting: Snow Owl includes a reporting and charting engine, which uses Snow Owl's semantic cache to accelerate report execution. A variety of graphs and charts can be created and exported in several formats including HTML, PDF, and Microsoft Office formats. Validation: An extensible validation framework allows additional validation rules to be plugged in and configured. Individual validation rules can be configured to execute in batch or single validation mode. Validation results are shown in concept editors and navigators in addition to the validation results view. High description logic expressibility: On top of the default SNOMED CT ontology expressibility Snow Owl supports the use of universal restriction, negation, disjunction, disjoint classes and concrete domains. Description logic classification: ELK, Snow Owl's default reasoner, performs description logic classification in parallel on modern multi-core computers. This allows the full international SNOMED CT plus the Australian extensions (830,926 relationships) to be classified and checked for equivalencies in about 10 seconds on a modern desktop computer. Snow Owl is also capable to run Protégé compliant and external reasoners. Task management: Snow Owl integrates with existing issue tracking systems to display, search, assign, and schedule issues and tasks. Collaborative editing: Task workflow support enables collaborative authoring. Individual tasks can be activated and associated terminological changes can be grouped into change sets associated with the tasks. When the workflow step is complete, the change set is provided as a context to allow the next participant in the process to easily continue the process. Upon final approval, the change set is committed to the terminology repository. SNOMED CT support: Working with SNOMED CT is simplified by providing a customized concept editor, navigator, advanced search, and query interfaces. Anatomical Therapeutic Chemical (ATC) classification support: Snow Owl supports mapping to ATC codes with a customized navigator and search interface. It's also possible to create and modify ATC codes. ICD-10, ICD-10-AM, ICD-10-CM support: Snow Owl supports browsing and searching ICD-10 classes, as well as mapping them to SNOMED CT via Complex Map Type Reference Sets. LOINC: Snow Owl supports browsing and searching LOINC browsing and searching LOINC, as well as mapping to and from SNOMED CT.
Extensibility: The Snow Owl framework can be extended by plugging in new terminologies, new editors, new navigation views, new classifiers, and more. 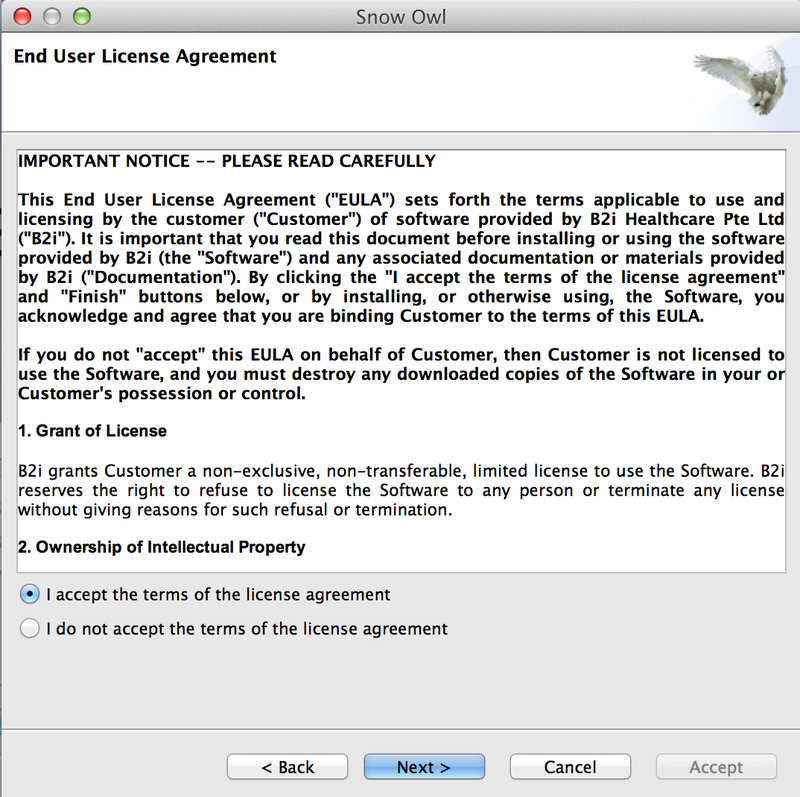 Import/export: Snow Owl supports importing and exporting the SNOMED CT release with reference sets in RF2 format, and the ATC Classification in ClaML format. For an introduction to the main functions and features please read the Getting Started with Snow Owl guide. Disk space requirements vary depending on the number and types of terminologies installed. For example, the complete history of SNOMED CT (including over a decade's worth of detailed changes), with ICD-10, ICD-10-AM, and ATC takes about 12GB. 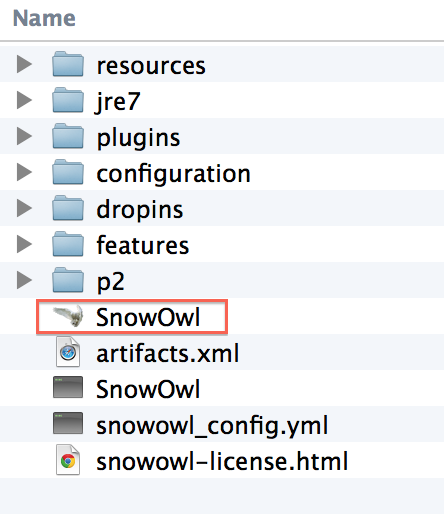 Unzip the Snow Owl file, open the Snow Owl folder, and double-click on the SnowOwl application icon . 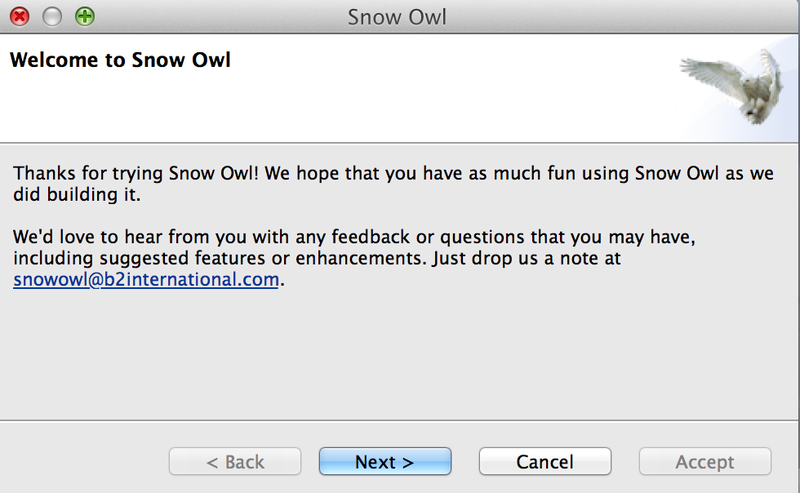 Click Next on the Welcome to Snow Owl page to proceed. Enter your username and licence code. You can use the Verify licence button to check if your code is valid. Click Next to proceed. Provide a password that you want to use for logging in, and re-enter your password. Click Next to proceed. Verify that you agree with the End User licence agreement. Click Next to proceed. Verify that you agree with the terms of the IHTSDO licence agreement. Click Accept to proceed. Click OK on the login screen to start the application. You can save your password by checking Remember me. If you are working in a collaborative mode, you need to click on the Repository... button and specify the terminology server before starting the application. 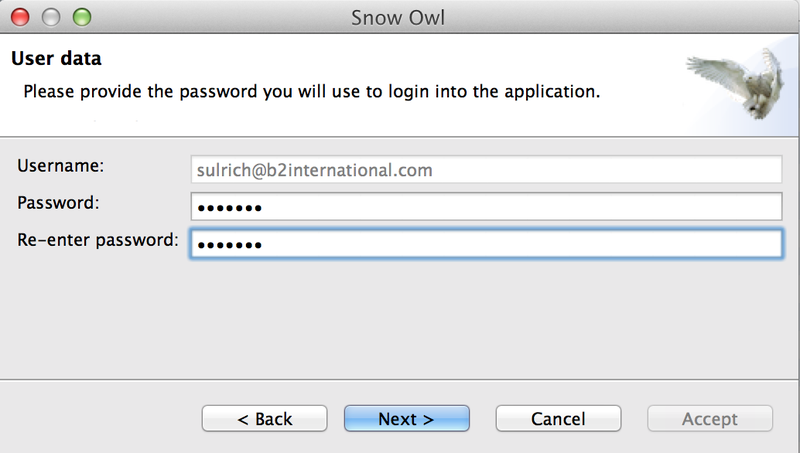 Click on the SnowOwl application icon in your Snow Owl folder to bring up the login screen. Hit OK to start the application. 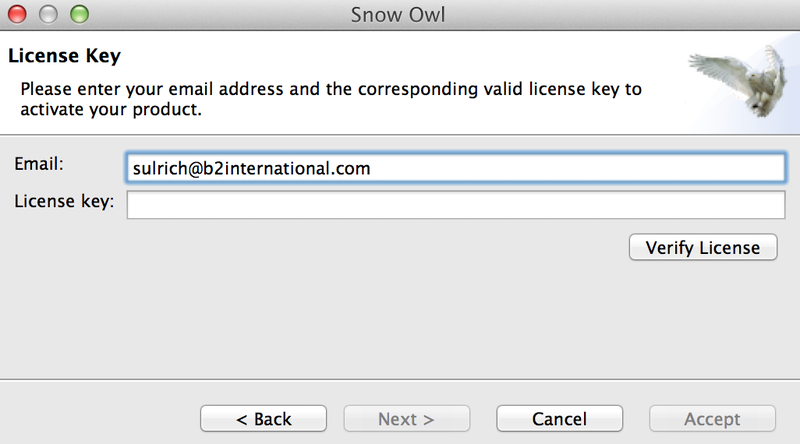 Note: If you are launching Snow Owl for the first time, please follow the steps described in the section above. Depending on what type of repository you choose at startup, Snow Owl can operate in either standalone or collaborative mode. By default it starts up as a standalone application and uses an embedded repository. You can review and change this setting by clicking on the Repository... button on the login screen. Embedded repository: Select this option if you want to use Snow Owl as a standalone application, without collaborating with others. You can use all editing capabilities, but your changes will only be stored on your computer. This is the default setting. Remote repository: Select this option if you want to be able to submit your changes to and receive other users' changes from a central terminology repository. 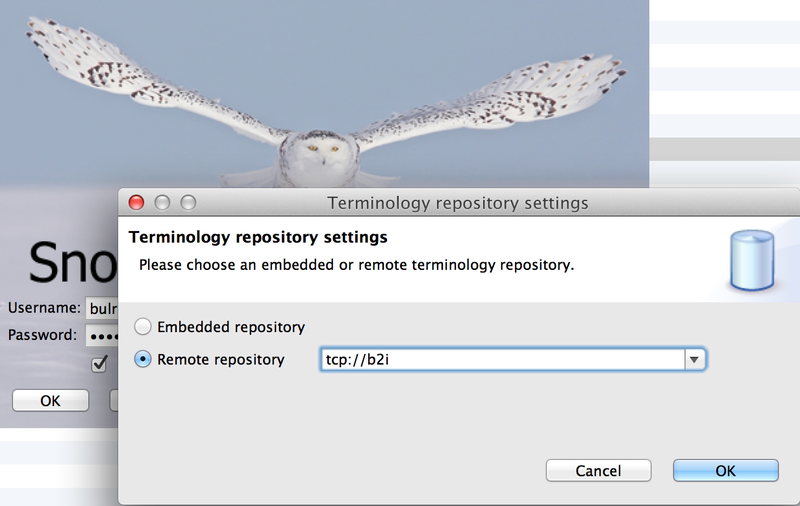 Enter the network address of the remote repository in the text field to the right. For detailed information about setting up a remote repository please refer to the chapter about Collaborative Authoring. Additional users can be created and assigned to groups using the Apache Directory Studio application. 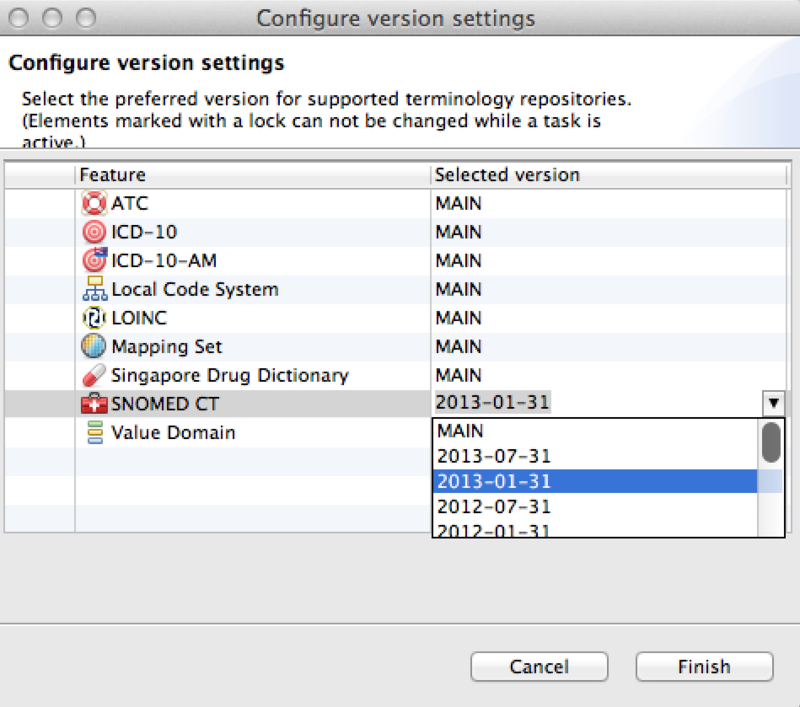 What version of SNOMED CT is included? All of them! 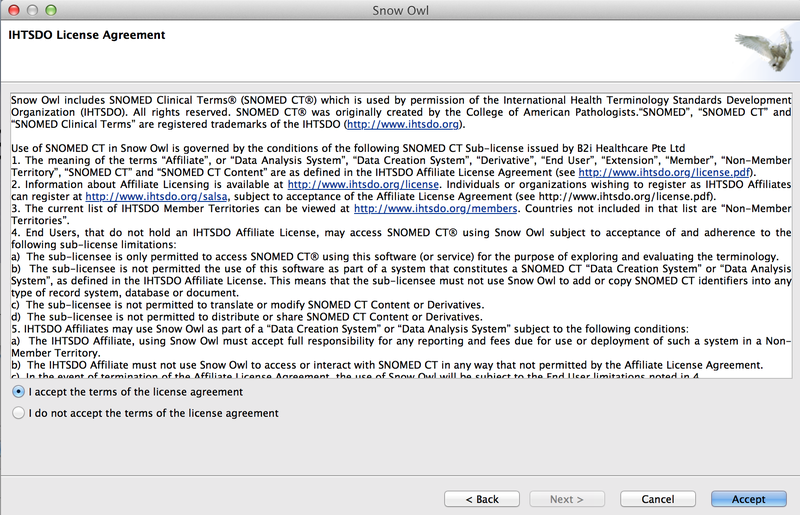 Snow Owl includes all versions of SNOMED CT since the January 31, 2002 release. To see the most recent release available in Snow Owl, double-click on SNOMED CT Concept in the SNOMED CT view. You can find the view on the left side of your screen. Detailed information about SNOMED CT will be displayed in the editor, which is located in the middle of your screen. A synonym specifies the current version, which is (as of Snow Owl 3.5) SNOMED Clinical Terms version: 20140131 (January 2014 Release). To switch to an older version, click the icon in the toolbar. You can see a list of the terminologies and local code systems that are supported in Snow Owl. The version selector always shows the version that is currently used in Snow Owl. By default, the latest version is used, which is indicated with MAIN. If you are using an older version, you will see the release date (for SNOMED CT), or the version number (e.g. for Local code systems). Select the preferred version from the list. Click Finish. You can see that the older version is now in use as indicated in the column for "Selected version"
For for further information please refer to the chapter Versioning.